Recipes which are made mainly or entirely in a stir-fry skillet or family skillet. This is the most indulgent chocolate recipe I know. I have to serve this with Creme Fraiche to cut through the sweetness but you can serve it with Whipped Cream or Ice Cream. I haven’t made it for ages but was asked to make it for a show last night and was reminded just how yummy it was. I think I was in too much of a hurry to serve it and it probably could have done with a little more time. So my top tip is to wait!!! The recipe needs a Wok or large Skillet that is safe to go into the oven (The Pampered Chef cookware is ideal for this). Preheat oven to 180oC/fan 160oC/Gas 4. Lightly spray bottom of Family Skillet with sunflower oil using Kitchen Spritzer. In Classic Batter Bowl, prepare both packets of brownie mix according to packet instructions. Spread cake batter evenly over bottom of skillet. Cut chocolate into small pieces on Cutting Board using 20 cm (8 in) Chef’s Knife. Sprinkle chocolate evenly over batter. Coarsely chop almonds using Food Chopper; sprinkle evenly over brownie. Lightly sprinkle with icing sugar using Flour/Sugar Shaker. 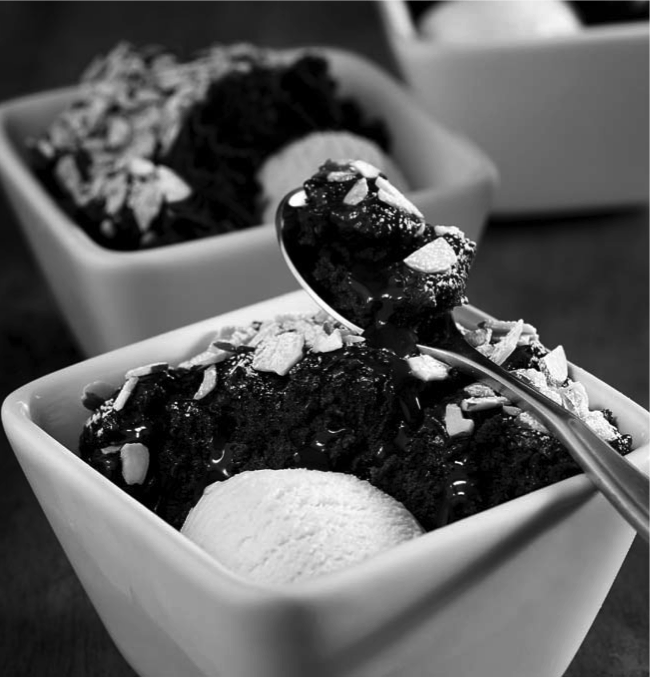 Spoon brownie into Simple Additions® Small Bowls using Nylon Spoon and serve warm with ice cream or whipped cream, if desired. It feels like ages since I have shared any recipes and blogged. Christmas has been planned for, cooked through, enjoyed and is now a dim memory! The new year is well and truly under way and I have been taking photos of my food but never getting round to sharing them. This morning, after being blessed with a lie-in, I came downstairs to find my eldest daughter had made pancakes. However, the only recipe she could find here was a more complicated Choc Chip version which needed ingredients we didn’t have. So, here it is; my first recipe of 2014 and it is dedicated to my fabulous daughter Cerys. These ingredients will make quite a few pancakes – depending on size it usually makes 12-15. Obviously, if you need less then divide the ingredients as you wish. I used to use a recipe which needing weighing but when someone reminded me that pancake mix is the same as a Yorkshire Pudding mix, a lightbulb went off! So now I just use a Pampered Chef Prep Bowl as a cup measurement and it’s very very easy. Using a whisk mix all the ingredients in a large bowl. (I thoroughly recommend a Pampered Chef Classic Batter Bowl, its the perfect size and has a spout to pour the mix into the saucepan). You are looking for a batter with the consistency of double cream. If necessary add a bit more milk. Heat a small sauté pan/ frying pan (the Pampered Chef Executive is the best option, you can even make your pancakes fat free with one of these!) with a small amount of sunflower oil. When smoking hot pour a ladleful of batter into pan, swirl it about to fill the bottom of the pan. Put onto the heat and wait until bubbles appear on the top and the edges of the pancake pull away from the pan. Flip the pancake, either by tossing it or using a slice under the pancake to help it along. I made this yesterday as a pudding and served it hot with cream and/or ice cream. Today we ate the (meagre!) leftovers cold. It is really yummy cold but utterly fabulous hot! And SO easy. Go, pick some blackberries and make it, now!!! Preheat oven to fan 170C/ 190°C/gas 5. If not using Pampered Chef Cake Tin…Grease a 20cm (8in) springform tin with butter, line the base with a circle of greaseproof paper and grease this too. 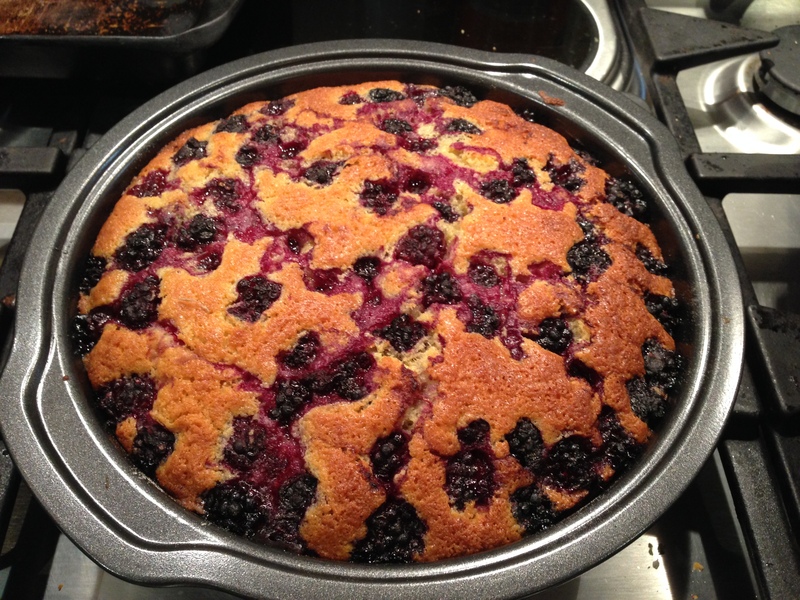 I actually christened my new Pampered Chef Cake Tin with this recipe and didn’t do ANYTHING to the tin! It came out perfectly (as you can see in the photo below)! Even I was amazed! Beat the butter and sugar in a large bowl until creamy – you can do this in a machine if you like. Add the eggs one by one, waiting until the last is completely beaten in before adding the next. If the batter curdles, add 1tsp of flour to bring it back together. Sift the flour into the bowl and fold in. Add a splash of milk (no more than 50ml/2fl oz) to loosen the mix. Spoon the batter into the tin and smooth out. Bake for 25-30 minutes in the wider, darker (which cooks quicker) PC Cake Tin or 35-40 mins in the 20cm greased tin, or until golden on top and a skewer inserted in the centre comes out clean. Cool in the tin for 5 minutes, then carefully release and cool completely on a wire rack. Serve with cream or ice cream or maybe even custard!! So here is the first thing I have made from the fabulous produce out of my neighbour’s amazing allotment. I have adapted this recipe from a BBC Good Food recipe so thanks to them for the inspiration. Peel, core and chop all the apples (made really easy with the Pampered Chef Apple Wedger, Vegetable Peeler and Forged Cutlery Knives). Add all ingredients to the large Stockpot. Bring the mixture to the boil over a medium heat. Simmer uncovered, stirring frequently, for 1-2 hrs, until thick and pulpy. Remove from the heat, transfer to sterilised, clean and dry jars and seal. And enjoy a small sense of smugness at having started making Christmas presents!! Note about sterilising jars. I know that you can put the jars in an oven for a while but I am always a last minute kind of girl! I therefore always sterilise jars the way Nigella Lawson suggests, which is to quarter fill each jar with water, Microwave on High for 10 mins. Job done! Today’s recipe isn’t for eating but it is a recipe and as I am cooking it this morning I thought I would share. My kids (of all ages) love playing with Play Dough. Its pretty pricey in the shops but with this recipe it is really cheap and easy to make. In fact, every time I make it it surprises me just how easy it is!! This makes for a great holiday activity. Put all the ingredients in a large pan & heat gently, stirring constantly. The dough is ready when it no longer sticks to your fingers. Knead on a lightly floured surface. I thoroughly recommend the Pampered Chef Executive Non-Stick pan and Mix ‘N Scraper for this. Makes the job a breeze to clean up as well as make!